Air travel may be a quick and convenient way to hop from one continent to the next, but based on the carbon footprints of airplanes, it’s wreaking havoc on the environment. Google is jumping in to try and help save the day, partnering with NASA and the CAFE Foundation to sponsor the Green Flight Challenge, inspiring aircraft engineers to create an extremely energy efficient aircraft. The Green Flight Challenge will be offering a $1.3 million first place prize to the team of engineers that designs an aircraft with the best practical, emission-free flight, proving it can be done. 13 teams are competing for the prize, the largest ever presented in civilian aviation. They have been instructed to design an aircraft prototype that can fly 200 miles in less than two hours, while burning the equivalent of 1 gallon of fuel per passenger. 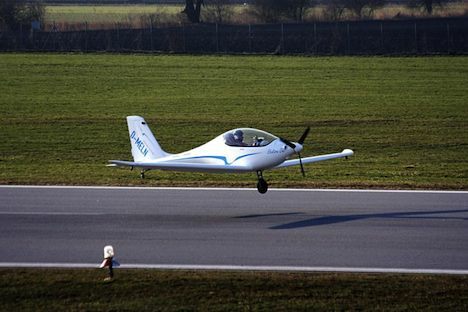 The planes entered into the competition are either electric or running on diesel, biofuel, ethanol or a hybrid system. There will be one grand prize winner as well as four runners-up, who will also receive a cash prize. Awards for the quietest aircraft and the best biofuel entry will also be distributed after evaluation of each entry. The challenge is scheduled for September 25th to October 3rd, taking place at the CAFE Foundation Flight Test Center at the Charles M. Schulz Sonoma County Airport in Santa Rosa, California. Looking to see what the contestants come up with as far as energy efficient aviation goes? Tickets will soon be available on the CAFE Foundation’s website.